Find the diagonal of a cube with a side length of . Where is the side length of the cube. If the volume of a cube was one eighth, what is the diagonal of the cube? Write the volume of a cube and substitute the given volume to find a side length. Write the diagonal formula for a cube and substitute the side length. There is a formula for the length of a cube's diagonal given the side length. However, we might not remember that formula as it is less common. However, we can also find the length using the Pythagorean Theorem. Taking the cube root gives us a side length of 4. Now let's look at our cube. We need to begin by finding the length of the diagonal of the bottom face of our cube (the green segment). This can be done either by using the Pythagorean Theorem or by realizing that the right triangle is in fact a 45-45-90 triangle. Either way, we realize that our diagonal (the hypotenuse) is . We now seek to find the diagonal of the cube (the blue segment). We do this by looking at the right triangle formed by it, the left vertical edge, and the face diagonal we just found. This time our only recourse is to do the Pythagorean Theorem. Suppose the volume of a cube is . What is the length of the diagonal? Write the equation for the volume of a cube. Substitute the volume to find the side length, . Write the equation for finding diagonals given an edge length for a cube. Substitute the side length to find the diagonal length. If the volume of a cube was , what is the length of the diagonal? Write the equation for finding the volume of a cube, and substitute in the volume. Write the diagonal equation for cubes and substitute in the given length. If the surface area of a cube was , what is the length of the diagonal? Write the surface area formula for cubes and substitute the given area. Write the diagonal formula for cubes and substitute the side length. When calculating the diagonal of the cube, point A to point B. We must first find the diagonal of the base of the cube. The base of the cube is a square where all sides are 8. The diagonal of the base would be from point A to point C in the drawing. We can see that the diagonal of the base and side BC of the cube form the two legs of a right triangle that will allow us to find the 3D diagonal of the whole cube. Use the pythagorean theorem with BC and the Diagonal of the Base. After simplifying everything we get the final answer for the Diagonal of the Cube (AB). 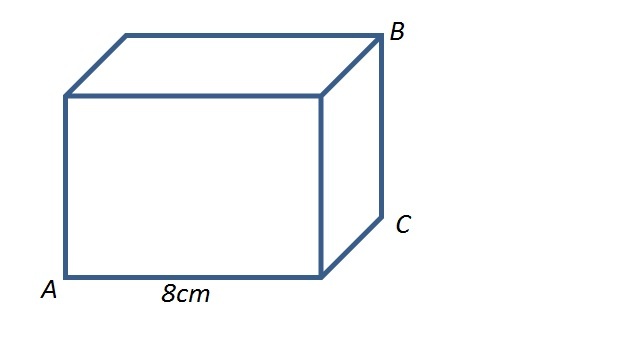 A cube has a side length of 6 meters. What is the length of its diagonal across one of the faces? Since all sides of a cube are equal and all sides form right angles, we use pythagorean theorem to find the length of the diagonal. CUNY Lehman College, Bachelor of Science, Biochemistry.